CHAMBERLAINS WORCESTER TEA SERVICE, CIRCA 1810. EX LAURANCE S. ROCKEFELLER ESTATE. 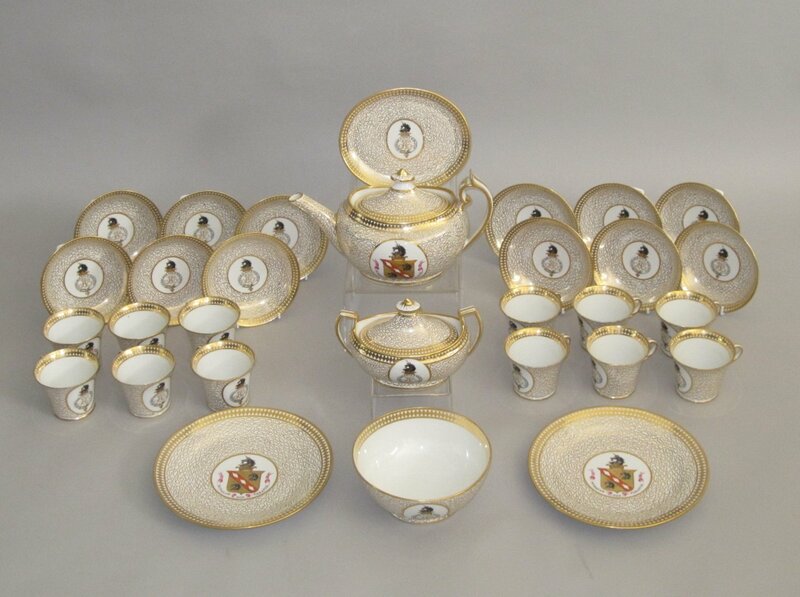 A CHAMBERLAINS WORCESTER TEA SERVICE, CIRCA 1810. PROVENANCE: EX LAURANCE S. ROCKEFELLER ESTATE, SOTHEBY'S NEW YORK OCTOBER 2005. Comprising: An oval teapot, cover & stand, a sucrier & cover, a bowl, two plates, twelve cups & saucers. Each painted with heraldic sheilds surmounted by the head of a unicorn emerging from a coronet & entwined initials within a garter. Inscribe with the motto: Nunquam non Paratus (never unprepared). The white ground with gilt vermiculi decoration within a gilt lozenge border. Laurance Spelman Rockefeller (May 26, 1910- July 11, 2004) was an American philanthropist, businessman, financier, and major conservationist. He was a prominent third generation member of the Rockefeller family.